One of our favourite campsites on Georgian Bay. Wow! Georgian Bay didn’t want to let us go. Parry Sound was reluctant to let us cross. Even on a light wind day, it was still choppy and rough. The Canadian shield is beautiful in its endless variation of colours and textures. Interesting Quartz designs in the rock. Geoff spotted Killdeer eggs while we were walking back and forth with gear to pack the canoe. The Killdeer was desperately trying to lure us away from her nest. Once we knew where they were, we quickly gave her the space to feel more comfortable. She promptly went back and sat on her nest. Can you spot the Killdeer sitting on her eggs in this photo? Geoff spotted in the rocks. A zoomed in photo of what we think is a Massassauga Rattlesnake. The massasauga is one of Canada’s most unusual snakes-and one of the most threatened. Formerly called the eastern massasauga, this solitary, passive and timid rattlesnake relies on camouflage to avoid detection, shaking its tail in warning when it feels threatened. Preferring flight to confrontation, it rarely strikes (and does so only if threatened), doesn’t pursue people and doesn’t always inject venom when it bites. Up to a metre in length, the massasauga has a stocky, grey-brown body with dark, round blotches down its back and sides. It has a diamond-shaped head, catlike pupils and a blunt tail with a hollow rattle made of segmented scales. Its diet consists mostly of small mammals and songbirds, but also includes lizards, frogs, toads and other snakes. It’s exhausting being Taq. He is pictured here taking a nap while we load the canoe. Instead of portaging, we are excited to be using the 44 locks on the Trent-Severn Waterway. Each lock can vary in size, design, and lifting/lowering mechanism. Below is a picture of the Parks Canada map of the waterway. At the time of this newsletter, we are at the Kirkfield lift lock. The majority of the locks on the Trent-Severn Waterway (TSW) are chamber locks. The basic principle is that water always finds it’s own level. When a boat enters the lock, gates are closed behind it so that it is enclosed in the chamber on all sides. Depending on whether the boat is going up or down, valves within the walls and gates of the chamber can be opened or closed to allow water to either enter or leave the chamber. For example, since we are travelling upriver, when we enter the chamber, the valves upriver are opened until the water level within the chamber rises and equals the elevation of the water upriver. Doors are closing behind us as we secure the canoe to the side. Once the lock fills with water, we will be exiting through the gate at the top. Once the lock is full, the gate opens and we out. Our kind of portaging! Jude was very excited to ride the Big Chute Marine Railway. It raised us 58 feet from Gloucester Pool to the Severn River. We paddled onto the large platform. Our canoe rested on the bottom of it while a winch cable pulled the platform up the railway tracks to the top. The platform lowered us down into the water where we paddled off to lunch at a nearby restaurant. A view of the Big Chute Marine Railway platform from the bottom. Loading onto the platform of the Marine railway. We like wind only when it is blowing mosquitoes away, or blowing in our favour. We’ve been able to do quite a bit of sailing this season already. We’ve had a lot of warnings about the variable weather on Lake Simcoe. Light winds enabled us to travel from Orillia on Lake Couchiching to Gamebridge on Lake Simcoe (32 km), in one day. Sailing on Lake Simcoe while the kids are napping. The beautiful MacDonald cut on the Severn River. The Severn Canal is calm with dense trees and shrubs lining the shoreline. This beautiful bridge frames Canal Lake in the background. It is another height of land for us – downriver paddling from here. Turtles sunning on a log. A Great Blue Heron hunting for fish. We are incredibly grateful to Katy and Bob MacDonald (Geoff’s parents) for encouraging us to basecamp from their home while we are in the area. While this has meant fresh homecooked meals, showers, and beds for us…it has meant countless hours of driving to pickup and dropoff locations along the Trent-Severn for them. The kids have loved spending the extra time with their Grandparents. It has been very hot for Taq already. We can’t thank them enough for looking after Taq as well. His leg is bothering him when he gets in and out of the canoe, and he isn’t handling the heat very well anymore. Maureen and Paul Sheridan know how to put on a great meal. We have shared countless delicious meals with them over the years. They met us on Lake Couchiching with a wonderful picnic lunch. In addition, we’d like to thank Paul for dropping us off at Pointe au Baril too. We are grateful to Maureen for playing with Jude and holding Rane during a newspaper interview. Dan from Penetang invited Jude to sit in the cockpit of his Cessna at Henry’s Fish Restaurant on Frying Pan Island. Joshua, Erin, and Jackson Green were moored for the night in Honeymoon Bay on Beausoleil Island. We decided to camp because of the beautiful sandy beach and picnic tables. We are thankful that they filled our water bottles (saved us having to pump/purify water from the lake) and for the cold pop they shared with us. Stu McGill took Jude for a little spin in his gorgeous, handmade wooden boat called the Sweet Loretta. Roberta Bell, from The Packet, sent us some photos she took of us after an interview on Lake Couchiching. We don’t have many pictures of us all in the canoe at the same time. Peter Shields is one of the Lockmasters at the Gamebridge Locks. He gave us 3 ice cold waters on a hot, muggy day. 6 degrees of separation – his wife went to school with my uncle in Grande Prairie! Meeting local people has been one of the biggest highlights of the trip for us. Shelly and Molly Aspector spotted us crossing the small bay in front of their house on our way to another lock. They waved us over and invited us into their home. What are the chances that we had an obligation that we were late for!? We regret that we weren’t able to take them up on their offer. 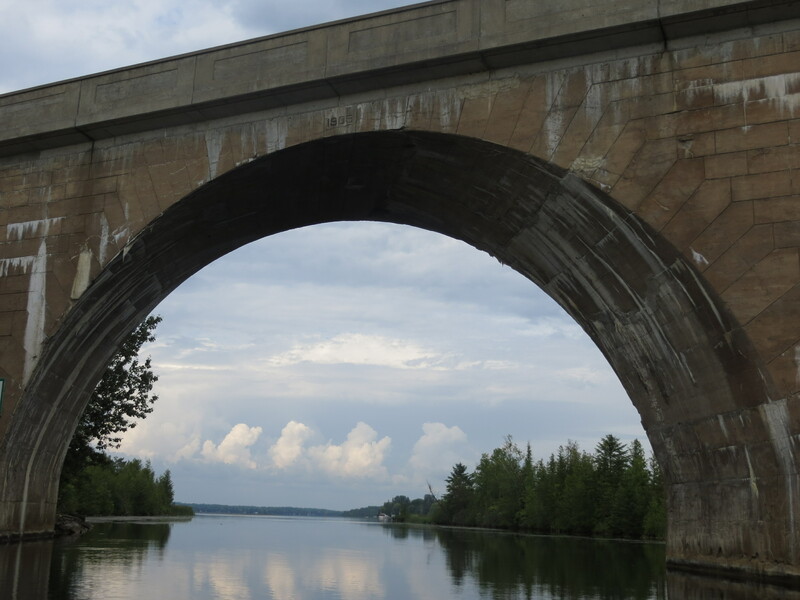 We will continue on the Trent-Severn Waterway to Lake Ontario. We are currently at the height of land at Kirkfield. This means that where there is current, we will be paddling with it! I came across the article on your family in The Globe this morning & have since passed the last 3 or 4 hours reading through your archived newsletters & blogs. As soon as I’m done posting this note I’ll be signing up for automatic updates from your website. What an awesome adventure! I am a canoeist too (although not to the degree you guys are!) & am enjoying living vicariously through your posts! I do hope you plan on writing a book when it’s all said & done… May the wind be always at your back. Haven’t even finished The Globe article before visiting you all on your excellent website. What a continuing accomplishment for you and your growing family ! We were particularly thrilled to follow you right now on the Trent-Severn as we boated for many years on Georgian Bay (and yes, you are quite right about the ‘extra’ winds seemingly always present, particularly the choppiness at Parry Sound). Can’t imagine canoe travel with your precious cargo as it sometimes was very ‘hairy’ for us and we were 38′ and 10 tons of steel ! Swift Current was our favourite lock and also Marine Railway – again going thru’ by canoe, very different. Keep safe and cool and Greetings from spectacular Victoria where we moved 18 years ago. Saw your canoe today passing our cottage on Balsam Lake. Instantly recognizable from the Globe & Mail article we had read earlier in the day. Bon Voyage. We have a place on the Fenelon River. Our place is downstream from the Falls and lock in Fenelon, on the south side of the river. We are sitting out keeping an eye out for you today (June 30th). Come by and say hi! Our daughter, Tessa was born the same days as your 2nd son. They can celebrate their 7-month birthday a day early! What an experience! Very courageous to attempt with such young children but so inspirational for them. God Bless you as you continue your journey. Paddle safe. Good luck to you all as you continue your voyage. Good luck and paddle safe. I’m so impressed with your amazing adventure and want to congratulate you for your trip thus far. One thing that you may not have considered: by heading up the Rideau, you will miss the 1000 Islands section of the St. Lawrence River. It is a spectacular part of Canada. If by chance you make a change and decide to come this way, we have a small but comfy cottage that we’d be glad to offer to you. We’re on the mainland, very close to the 1000 islands bridge. Just let me know! I’ve got another offer : my husband and I live in Ottawa very close to the Rideau River. And so if you would like a place to stay here, we’d be more than happy to host you. Again, just let me know. Happy travels! Canada Day highlight! Yesterday, while at my sisters cottage on Sturgeon Lake we saw you paddling towards Bobcaygoen. We came over (Michael, Yvonne, myself and our 3 doggies) to say hello and wish you good luck as you paddle across Canada. It was so delightful to meet you and share a few moments together on Canada Day. All the best…safe travels. We live on the west shore of Clear Lake just south of the exit from Stoey Lake. If you need any supplies or a bed for the night we have plenty of space. Also consider a visit o the Canadian Canoe Museum in Peterborough. We would be plesed to pick you up from the Liftlock and give you a tour through the only museum of its type in the world. We wish you smooth and safe paddling. Regards, David and Susan.